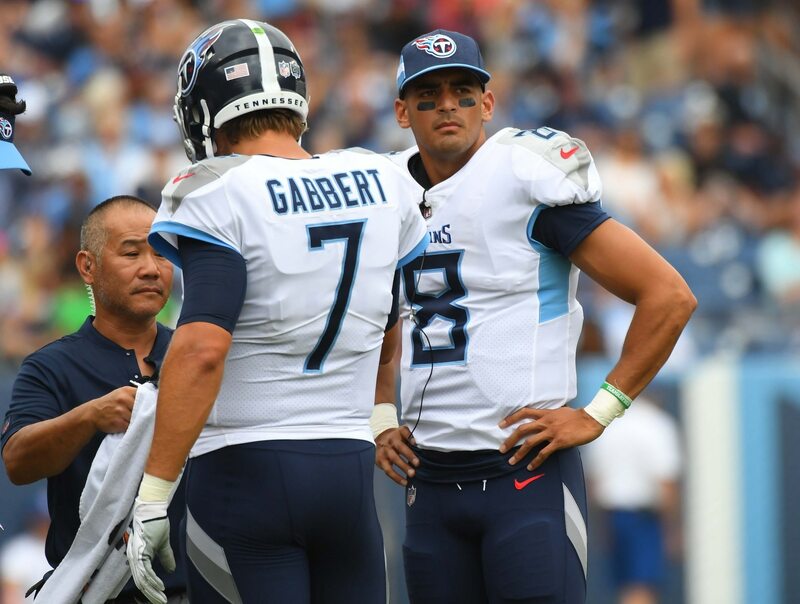 The Tennessee Titans might be without the services of starting quarterback Marcus Mariota in Week 3 against the Jacksonville Jaguars. Mariota is still recovering from an elbow injury that’s caused him to lose some feeling in his throwing hand. He missed last weekend’s game — a stunning 20-17 win over the Houston Texans — and his status for Sunday’s road game in Jacksonville is still undetermined. Speaking about his young quarterback on Friday, head coach Mike Vrabel did say Mariota has slightly improved since last weekend but couldn’t say if he’d be available this weekend. The team’s big win over Houston in Week 2 had less to do with Mariota’s backup, Blaine Gabbert, than it had to do with defense and a spectacular special-teams play that proved the difference in the outcome. Playing in both games this season, and starting last weekend, Gabbert has completed 57.1 percent of his passes for 234 yards with one touchdown and one interception.